This one doesn’t concern fruits but rocks. I guess you must have read in the papers about some rocks called PedraBrancaon which Horsburgh Lighthouse stands. Why is it in the papers? The newspapers reported that Malaysian and Singapore leaders have recently issued statements about the ownership of PedraBranca, which has been in Singapore’s control since the 1840s. According to a report in the papers (Straits Times, 23 Dec 2002), “the question of who owns PedraBrancawas raised in 1979”. The interesting point I want to share with you is that Singapore issued a set of stamps in 1982with the theme, “Lighthouses of Singapore”. 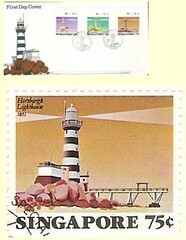 Yes, as you have guessed, the set included a stamp of Horsburgh Lighthouse. Notice too that the special envelope (First Day Cover) features this lighthouse.